Tadarida brasiliensis, the smallest free-tailed bat, is 3 1/2 - 4 3/8 inches in length, with a forearm length of 1 3/8 – 1 3/4 inches, and a mass of 11-14 grams. They are snub nosed and thickset, dark brown or gray on top, with hairs that are whitish at the base. Ears of this species are separated at the base, and the tail is naked, with at least half extending beyond the interfemoral membrane. Wings are narrow, and flight is straight. Spoon-shaped bristles on the hind toe are used to groom themselves, and thumb and toe claws have double talons. In the east and on the west coast this bat hibernates but does not migrate; bats in Texas and the southwest usually migrate to Mexico in October and return in March. Older males may remain on the wintering grounds year-round ( Thies et al., 1996 ). This species lives in large colonies in caves and buildings. Young hang together in a nursery, and mothers return and feed any of them. The lifespan is usually 13-18 years for males and 12 for females, who produce 1 offspring per year (McCracken, 1986). Breeding occurs in southern U.S., from Oregon, Nebraska, Louisiana, and South Carolina south to Mexico. These bats winter on their breeding grounds or migrate to Mexico. This is one of the most abundant North American mammals, and the most common bat in the southwest U.S., with an estimated population of 120-150 million in the U.S. (McCracken, 1986). However, the population in Carlsbad Caverns, New Mexico, has declined from 8-9 million to several hundred thousand since the 1930’s. High cave site fidelity due to limited number of maternity caves. Return to cave nightly unless migrating, and return to same cave after seasonal migration if available. Sometimes must relocate due to human disturbance and habitat loss (McCracken, 1986). Patterns are distinguishable in departure and arrival to and from cave, but thousands may be moving together. Though difficult to get an accurate count, probably should be classified as “simple”. Easier to estimate during roosting. Adults roost in densities of 1800 per square meter, and newborns 5000 per square meter (McCracken, 1986). May travel up to 150 miles to feed, though some (including those at Carlsbad Caverns) stay within 50 miles of their cave. Feeding occurs in flight, from sunset to sunrise, at approximately 10-15 mph and includes insects such as moths, ants, beetles, and leafhoppers. Bats (N=17) were collected in Arizona, from houses in Tucson, and Cochise, Eagle Creek Cave, and from a waterhole in Sabino Canyon, Pima County; 5 additional bats found dead or dying were collected from the University of Arizona campus in Tucson ( Reidinger 1976 ). Mean (range) organochlorine concentrations (ug/g wet weight) were: 3.3 (0.7-27.0) p,p’-DDE, ND p,p’-DDD, and 0.1 (<0.1-0.4) p,p’-DDT. Three bats found dead or dying contained 33.0-300 ug/g o,p’-DDT, and 4 probably also contained Toxaphene. Some of the live bats contained dieldrin at <1.2 ug/g, and 3 collected alive contained toxaphene, 1 contained <2 ug/g Aroclor 1254, and 1 contained <2 ug/g Aroclor 1260. In June 1973, 59 bats were collected from Bracken Cave, Texas, including 2 males, 18 pregnant females, 12 live young from the cave floor and 15 from the ceiling, 11 postpartum females, and 1 female in parturition ( Clark, Jr. et al., 1975 ). Five pregnant females contained 0.49-0.6 ug/g wet weight DDE in brain; and a mean (range) of 4.19 (2.5-6.2) DDE, 0.303 (0.17-0.67) DDT, and 0.202 (ND-1.0) dieldrin in carcass. Three postpartum females contained 0.67, 1.6, and 2.5 ug/g DDE. The males contained ND and 1.1 ug/g DDE in brain, and 3.6 and 11 ug/g DDE in carcass. DDT was 0.23 ug/g in the yearling male and 0.34 ug/g in the older male. Two pregnant and 3 postpartum females had a mean concentration of 0.040 ug/g heptachlor epoxide. Aroclor was detected in 4 bats and DDD was detected in 2. Bats were collected from Carlsbad Caverns, New Mexico in 1973, 1974, 1975, and 1976; at Bracken Cave, Texas in 1975; at Eagle Creek Cave, Arizona in 1975; and at Newman Bridge, California in 1976 ( Geluso et al., 1981 ). At Carlsbad (N=24), DDE in adults ranged from 3-66 ug/g; the lowest geometric mean was in 1975 (11 ug/g), and the highest in 1974 (25 ug/g). Mean (range) DDE was 7 (4-13) ug/g at Eagle creek, 6 (4-9) ug/g at Bracken, and 12 (8-18) ug/g at Newman. DDE in brain ranged from 0.19-17.0 ug/g. In July 1975, 80 adult postpartum females were collected at Bracken Cave, Texas, and transported to Laurel, Maryland ( Clark Jr. et al., 1977 ). Of 22 that survived, 5 were fed untreated mealworms (average DDE in worms=0.106 ug/g wet weight) and 17 fed mealworms that had been raised on bran containing 100 ppm DDE (average DDE in worms=107 ug/g) for 40 days. One treated bat died in an accident, 4 treated bats were frozen, and the remaining 17 bats were starved to death. Mean DDE in brain of treated bats was 483 ug/g. In 1983, 10 fledgling bats were collected in August from Carlsbad Caverns, New Mexico, and 10 were collected from a reference site, Bracken Cave, Texas ( White et al., 1986 ). Geometric mean DDE concentration in whole body (minus skin, intestinal tracts, and brains) was 1.9 (1.2-4.8) ug/g wet weight for Bracken Cave, and 22 (11-46) ug/g for Carlsbad Caverns. Pregnant female bats were collected from Carlsbad Caverns, New Mexico, in 1991 (N = 15), and from Vickery Cave, Oklahoma in 1990 (N = 12) and 1991 (N = 14) ( Thies et al., 1994b . Mean (range) DDE (ug/g wet weight) in carcasses of pregnant females (minus embryos and brains) was: 1.38 (0.40-99.32) from Vickery in 1990, 2.23 (ND-7.56) from Carlsbad in 1991, and 0.65 (ND- 2.55) from Vickery in 1991. Mean (range) DDE in brain of pregnant females was: 0.36 (ND-7.30) from Vickery in 1990, 0.04 (ND-0.27) from Carlsbad in 1991, and 0.02 (ND- 0.11) from Vickery in 1991. Vickery 1990: May, female, 1.706 (0.398-99.315); June, female, 0.252 (0.043-0.758); July, female, 0.303 (0.010-3.022); August, female, 0.045 (0.010-0.228); male, 0.899 (0.437-12.802). Vickery 1991: May, female, 0.578 (0.010-2.550); male, 0.891 (0.010-2.709); August, female, 0.067 (0.010-0.208); male, 1.301 (0.550-21.883). Carlsbad, 1990, August: female, 2.455 (0.423-9.342); male, 4.682 (1.329-34.693). Carlsbad, 1991: May, female, 1.845 (0.010-7.559); male, 4.617 (2.098-10.473); August, female, 4.687 (0.010-14.031); male, 14.261 (2.911-37.474). Vickery 1990: May, female, 0.042 (0.010-7.295); June, female, 0.014 (0.010-0.026); July, female, 0.019 (0.010-0.099); August, female, 0.013 (0.010-0.066); male, 0.0.23 (0.010-0.156). Vickery 1991: May, female, 0.021 (0.010-0.110); male, 0.074 (0.010-1.001); August, female, 0.016 (0.010-0.102); male, 0.057 (0.010-1.000). Carlsbad, 1990, August: female, 0.018 (0.010-0.236); male, 0.055 (0.010-0.226). Carlsbad, 1991: May, female, 0.043 (0.010-0.271); male, 0.036 (0.010-0.475); August, female, 0.049 (0.010-0.484); male, 0.079 (0.010-0.629). DDE ranged from 0.122-11.020 ug/g in liver, 0.056 to 2.581 ug/g in kidney, and 0.116-0.149 ug/g in testes. In 1993, 10 adult female bats were collected from Eckert James River Cave ( Thies et al., 1997 ). Mean (range) carcass (minus skin, wings, feet, gastrointestinal tract, embryo, skull, and brain) DDE was 2.313 (0.963-87.355) ug/g wet weight in bats collected in May and 0.386 (0.088-4.498) ug/g in August. DDE in brain was 0.186 (0.067-5.172) ug/g in May and 0.150 (0.026-1.080) ug/g in August. In 1996, 21 venter samples were collected from dry museum skins of bats from Carlsbad Caverns, New Mexico ( Clark, 2001 ). Mean (range) organochlorine concentrations in carcass (ug/g lipid weight) for 1930 (N=3), 1956 (N =4), 1965 (N =8), 1973 (N =5), and 1988 (N =6) respectively, were: 14.7 (7.28-29.7), 27.2 (17.2-42.9), 86.3 (69.6-107), 128 (48.7-335), 30.8 (9.31-102) for p,p’-DDE; 21.5 (10.7-43.4), 23.1 (14.5-36.9), 32.5 (28.3-37.5), 2.33 (1.32-4.10), 1.30 (0.504-3.33) for p,p’-DDT; 11.3 (7.72-16.6), 6.40 (5.35-7.65), 7.79 (6.81-8.92), not reported, 0.489 (0.272-0.881) for o,p’-DDT; 79.7 (44.1-144), 76.7 (54.7-108), 64.3 (56.7-72.9), not reported, 23.1 (11.0-48.2) for PCB; 0.897 (0.523-1.54), 1.36 (0.898-2.06), 1.91 (1.78-2.05), not reported, 4.62 (1.44-14.9) for dieldrin; and 0.786 (0.623-0.993), 1.47 (1.27-1.69), 1.03 (0.878-1.21), not reported, 0.267 (0.126-0.563) for lindane. Bats were collected from Carlsbad Caverns, New Mexico in 1973, 1974, 1975, and 1976; at Bracken Cave, Texas in 1975; at Eagle Creek Cave, Arizona in 1975; and at Newman Bridge, California in 1976 ( Geluso et al, 1981 ). At Carlsbad (N=24), DDE concentrations in young bats ranged from 19-300 ug/g wet weight; the lowest geometric mean was in 1976 (43 ug/g), and the highest was in 1974 (101 ug/g). At Eagle creek (N=8), the mean was 9 ug/g, and the range 4-22 ug/g; at Bracken (N=2) the mean was 10 ug/g, and the range 6-15 ug/g; at Newman (N=5) the mean was 13 and the range 10-17. In June 1973, 59 bats were collected from Bracken Cave, Texas, including 2 males, 18 pregnant females, 12 live young from the cave floor and 15 from the ceiling, 11 postpartum females, and 1 female in parturition ( Clark, Jr. et al., 1975 ). Mean (range) DDE was 0.543 (ND-1.4 ug/g) wet weight in brains of young collected from the ceiling (10 detects) and 1.123 (ND-5.5) ug/g in those collected from the floor (8 detects). Carcasses of young collected from the floor had mean concentrations of 6.67 ug/g DDE, 0.648 ug/g DDT, and 0.508 ug/g dieldrin. Carcasses of young collected from the ceiling contained had mean concentrations of 5.26 ug/g DDE (15 detects), 0.392 ug/g DDT (14 detects), and 0.379 ug/g dieldrin (13 detects). Milk samples from stomachs of 11 young bats contained 0.83 to 10.1 ug/g DDE. Eight young found on the floor showed marked weight loss. Embryos contained 0.544 (0.16-1.2) ug/g DDE. Mean cis-chlordane was 0.030 ug/g in 4 pregnant and 3 postpartum females and 0.182 ug/g in 16 young. Pregnant female bats were collected from Carlsbad Caverns, New Mexico, in 1991 (N = 15), and from Vickery Cave, Oklahoma in 1990 (N = 12) and 1991 (N = 14) ( Thies and McBee, 1994b ). Mean (range) DDE in embryos was 0.14 (0.03-46.72) ug/g wet weight from Vickery in 1990, 0.09 (0.03-0.35) ug/g from Carlsbad in 1991, and 0.05 (ND- 0.48) ug/g fromVickery in 1991. DDT ranged from 0.035-0.067 in 9 embryos from Vickery and was not detected at Carlsbad. Heptachlor ranged from 0.017-0.117 ug/g in 12 embryos from Vickery and 2 from Carlsbad. Lindane was detected in 1 embryo, at 0.324 ug/g. 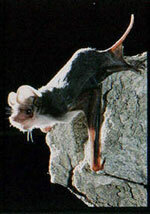 In 1993, juvenile bats (N=6 male, 6 female) were collected from Eckert James River Cave, Texas ( Thies and Thies, 1997 ). Carcasses (minus skin, wings, feet, gastrointestinal tract, embryo, skull, and brain) contained mean (range) DDE of 4.025 (1.519-28.531) ug/g, wet weight in females and 7.756 (1.896-30.326) ug/g in males. Brains DDE was 0.765 (0.140-9.146) ug/g in females and 0.837 (0.043-4.122) ug/g in males. In June 1973, 2 samples of guano collected from Bracken Cave, Texas contained 0.61 and 0.58 ug/g DDE and 0.14 and 0.12 ug/g DDT. ( Clark Jr. et al., 1975 ). In 1991, bat guano was collected from the following caves in Mexico: Tigre, Sonora; Maviri, Sinaloa; Ojuela, Durango; T. Bartolo, Nuevo Leon; Boca, Nuevo Leon; Mula, Tamaulipas; Quintero, Tamaulipas; Abra, Tamaulipas ( Clark et al., 1995 ). Concentrations of p,p’-DDE (ug/g dry weight) in guano collected from these caves, in the order listed above were 0.35, 0.14, 0.99, 0.43, 0.63, 0.52, 0.13; p,p’-DDT concentrations were ND, 0.02, 0.01, 0.03, 0.01, 0.06, 0.02, 0.01; o,p’-DDT was only detected at T. Bartolo, at 0.01 ug/g; p,p’-DDD was only detected at Mula, at 0.01 ug/g; dieldrin was only detected at T. Bartolo, at 0.91 ug/g; β-BHC was detected at 0.01 ug/gat Quintero and Abra; oxychlordane was only detected at Mula, at 0.03 ug/g; heptachlor epoxide was only detected at Mula, at 0.04 ppm; and t-non-achlor was detected at 0.01 ug/gin Tigre and T. Bartolo. Bats were collected from Vickery Cave and Carlsbad Caverns in May and August of 1991 ( Thies et al., 1994a ). Six males and six females were collected from each cave. Mean (range) Pb in livers was (ug/g wet weight): 1.91 (1.41-2.96) females, Carlsbad, May; 4.35 (1.11-13.70) females, Carlsbad. August; 2.22 (0.74-7.07) females, Vickery, May; 5.07 (2.47-34.90) females, Vickery, August; 3.51 (1.25-7.72) males, Carlsbad, May; 3.67 (1.45-16.00) males, Carlsbad, August; 5.37 (1.84-49.44) males, Vickery, May; 5.34 (1.40-27.64) males, Vickery, August. Mean (range) Cd in livers was: 0.53 (0.22-1.31) females, Carlsbad, May; 0.80 (0.52-1.55) females, Carlsbad. August; 0.88 (0.47-1.52) females, Vickery, May; 1.16 (0.60-1.98) females, Vickery, August; 0.44 (0.28-0.67) males, Carlsbad, May; 0.88 (0.51-1.46) males, Carlsbad, August; 0.44 (ND-1.02) males, Vickery, May; 0.20 (ND-0.22) males, Vickery, August. Hepatic As was only detected in 1 bat, a male from Vickery, collected in August. In July 1975, 80 adult postpartum females were collected at Bracken Cave, Texas, and transported to Laurel, Maryland ( Clark, Jr. et al., 1977 ). Of 22 that survived, 5 were fed untreated mealworms (average DDE in worms=0.106 ug/g wet weight) and 17 fed mealworms that had been raised on bran containing 100 ppm DDE (average DDE in worms=107 ug/g) for 40 days. One treated bat died in an accident, 4 treated bats were frozen, and the remaining 17 bats were starved to death. Weight at onset of starvation and at death were significantly lower in treated bats than in untreated bats (10.0 g and 9.31 g; 7.33 g and 6.94 g). Days to starvation averaged 9.4 for untreated bats and 5 for treated bats; average daily weight loss was 0.29 g for untreated bats and 0.55 g for treated bats. Four treated bats exhibited prolonged tremoring periods. In 1990 and 1991, 200 bats were collected from Carlsbad Caverns, New Mexico and Vickery Cave, Oklahoma ( Thies et al., 1996 ). Bats from both caves have been exposed to DDE, although concentrations at Carlsbad are generally higher. Chromosomal aberration assays were conducted in marrow from both humeri. Chromatid breaks were found in 60 of 177 samples: 49 had single breaks, 9 had two, 1 had three, and 1 had five. In addition, 6 bats had acentric fragments, 5 had deletions of a chromosome arm, and 1 had a single deletion. Frequencies of aberrations were too low to conduct statistical analysis. Spleen: Vickery, 1990: May, female, 3.18; June, female, 3.24; July, female, 3.05; August, female, 3.08; male, 2.57. Vickery, 1991: May, female, 2.37; male, 2.24; August, female, 2.21; male, 2.25. Carlsbad, 1990, August: female, 3.09; male, 2.76. Carlsbad, 1991: May, female, 2.33; male, 2.33; August, female, 2.87; male, 2.33. Testes: Vickery, 1990, August, 2.57. Vickery, 1991: May, 2.24; August, 2.60. Carlsbad, 1990, August, 2.76. Carlsbad, 1991: May, 2.33; August, 2.33. Dead and dying bats were collected from roosts in Mineral Wells, Texas (N=23) between June and October of 1993 ( Clark et al., 1996 ). Of these, 14 of 16 males and 3 of 7 females were rabid. One of the non-rabid bats (an adult female) had ChE activity at 2.7 μmol/min/g, which was 27% that of controls (9.9 μmol/min/g), indicating ChE poisoning. No anti-ChE compounds were detected in the digesta (N=3). Clark, D.R. Jr. 2001. DDT and the decline of free-tailed bats (Tadarida brasiliensis) at Carlsbad Cavern, New Mexico. Arch. Environ.Contam. Toxicol. 40:537-543. Clark, D.R. Jr., C.O. Martin, and D.M. Swineford. 1975. Organochlorine insecticide residues in the free-tailed bat (Tadarida brasiliensis) at Bracken Cave, Texas. J. Mammal. 56:429-443. Clark, D.R Jr., and J.C. Kroll. 1977. Effects of DDE on experimentally poisoned free-tailed bats (Tadarida brasiliensis): lethal brain concentrations. J. Toxicol. Environ. Health 3:893-901. Clark, D.R. Jr., A. Lollar, and D.F. Cowman. 1996. Dead and dying Brazilian free-tailed bats (Tadarida brasiliensis) from Texas; rabies and pesticide exposure. Southwest. Nat. 41:275-278. Clark, D.R. Jr., V.A. Moreno, and M.A. Mora. 1995. Organochlorine residues in bat guano from nine Mexican caves, 1991. Ecotoxicology 4:258-265. Geluso, K.N., J.S. Altenbach, and D.E. Wilson. 1981. Organochlorine residues in young mexican free-tailed bats (Tadarida brasiliensis mexicana) from several roosts. Amer. Midl. Nat. 105: 249-257. McCracken, G.F. 1986. Why are we losing our Mexican free-tailed bats? Bat Conservation International 3:3. Reidinger, R.F. 1976. Organochlorine residues in adults of six southwestern bat species. J. Wildl. Manage. 40:677-680. Thies, M., and D. Gregory. 1994. Residues of lead, cadmium, and arsenic in livers of mexican free-tailed bats. Bull. Environ. Contam. Toxicol. 52:641-648. Thies, M.L., and K. McBee. 1994. Cross-placental transfer of organochlorine pesticides in Mexican free-tailed bats from Oklahoma and New Mexico. Arch. Environ. Contam. Toxicol. 27:239-242. Thies, M.L., K. Thies, and K. McBee. 1996. Organochlorine pesticide accumulation and genotoxicity in Mexican free-tailed bats from Oklahoma and New Mexico. Environ. Contam. Toxicol. 30:178-187. Thies, M.L., and K.M. Thies. 1997. Organochlorine residues in bats from Eckert James River Cave, Texas. Bull. Environ. Contam. Toxicol. 58:673-680. White, D.H., and A.J. Krynitsky. 1986. Wildlife in some areas of New Mexico and Texas USA accumulate elevated DDE residues 1983. Arch. Environ. Contam. Toxicol. 15:149-158.